In Depression-era Boston, a city divided by privilege and poverty, two unlikely friends are bound by a dangerous secret in this mesmerizing work of historical fiction from the New York Timesbestselling author of The Perfume Collector. Maeve Fanning is a first generation Irish immigrant, born and raised among the poor, industrious Italian families of Boston’s North End by her widowed mother. Clever, capable, and as headstrong as her red hair suggests, she’s determined to better herself despite the overwhelming hardships of the Great Depression. However, Maeve also has a dangerous fondness for strange men and bootleg gin—a rebellious appetite that soon finds her spiraling downward, leading a double life. When the strain proves too much, Maeve becomes an unwilling patient in a psychiatric hospital, where she strikes up a friendship with an enigmatic young woman, who, like Maeve, is unable or unwilling to control her un-lady-like desire for freedom. Once out, Maeve faces starting over again. Armed with a bottle of bleach and a few white lies, she lands a job at an eccentric antiques shop catering to Boston’s wealthiest and most peculiar collectors. Run by an elusive English archeologist, the shop is a haven of the obscure and incredible, providing rare artifacts as well as unique access to the world of America’s social elite. 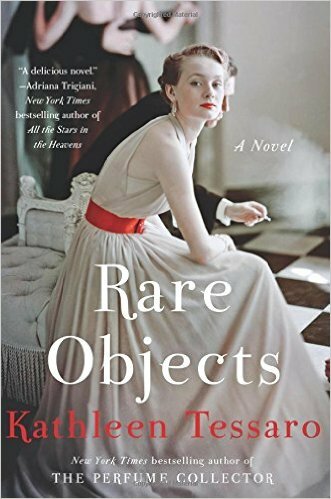 While delivering a purchase to the wealthy Van der Laar family, Maeve is introduced to beautiful socialite Diana Van der Laar—only to discover she’s the young woman from the hospital. Reunited with the charming but increasingly unstable Diana and pursued by her attractive brother James, Mae becomes more and more entwined with the Van der Laar family—a connection that pulls her into a world of moral ambiguity and deceit, and ultimately betrayal. Bewitched by their wealth and desperate to leave her past behind, Maeve is forced to unearth her true values and discover how far she’ll to go to reinvent herself. Larger than life characters make this story resonate. Nice prose that flows easily at a good clip made this an easy enjoyable book to read. The main characters find themselves in believable dilemmas where they sometimes make very human mistakes. Plenty of conflict is what made this book so readable while an interesting era and setting added great ambiance and social background. I would definitely read another book by this author. A rich story filled with plenty of conflict and interesting turns. Thank you to the author and publisher. I received a free copy of this book in exchange for an honest review. Visit my blog, http://greathistoricals.blogspot.ca, where the great historical fiction is reviewed! For fascinating women of history bios and women's fiction please visit http://www.historyandwomen.com.